The beautifully crafted Artisan range of Laguiole by Louis Thiers embodies the true rustic charm of Laguiole. 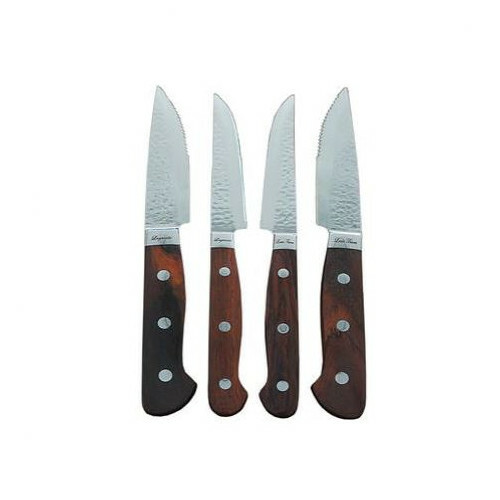 Each steak knife features a gently curved ebony wood handle for comfort and control. Each knife is unique as no two pieces of ebony wood are the same. Made of hammered Damascus forged full tang (single piece) stainless steel, these knives are not only beautiful, they are also razor-sharp. The blades core of VG10 steel is clad on each side with Damascus steel composed of 33 alternating layers of 430 and 304 grade stainless steel. Resulting 67-layer blade is thin and light yet strong and hard, with a supersharp cutting edge that has a hardness score of HRC 60 (+/- 1) which reduces drag when cutting and helps to quickly release food from the blade. 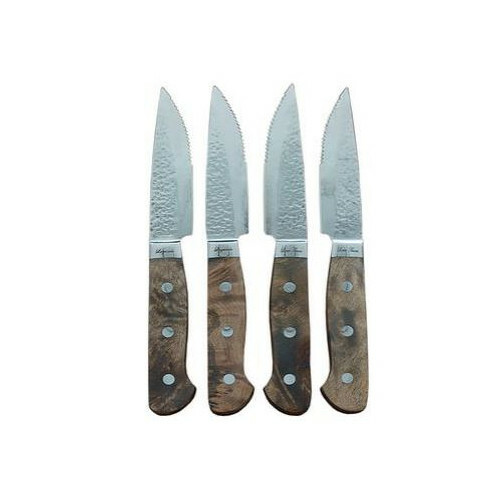 The bolster of each piece is laser-etched with the famous Laguiole bee insignia. Each piece is hand finished for a difference in quality you can see and feel. All Laguiole by Louis Thiers cutlery has passed the TV Rheinland GRAS (FDA) food safety test. Laguiole (La-YOLE) is a small town in the Aubrac mountains of south central France and has been the center of artisan knife production for centuries. The symbol of Laguiole is the bee which is on all Laguiole items. ​Louis Thiers delivers traditional elegance with the timeless Laguiole shape. The Louis Thiers company upholds the tradition of designing and manufacturing Laguiole cutlery, knives and utensils to the highest of standards. The quality and craftsmanship of their products is recognized world-wide. 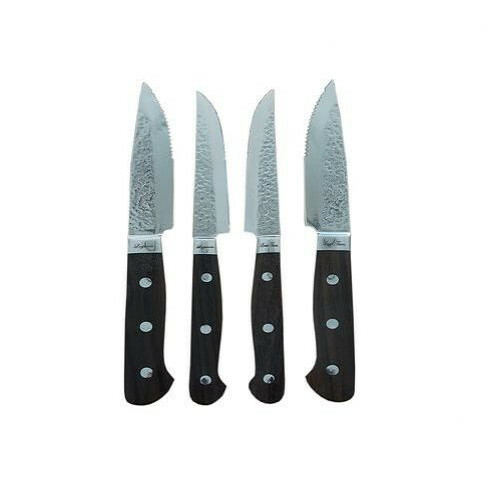 When you buy a Jumbo Steak Knives Damascus Blades online from Temple & Webster in Australia, we make it as easy as possible for you to find out when your product will be delivered to your home in Melbourne, Sydney or any major city. You can check on a delivery estimate for the Laguiole by Louis Thiers Part #: LT here. 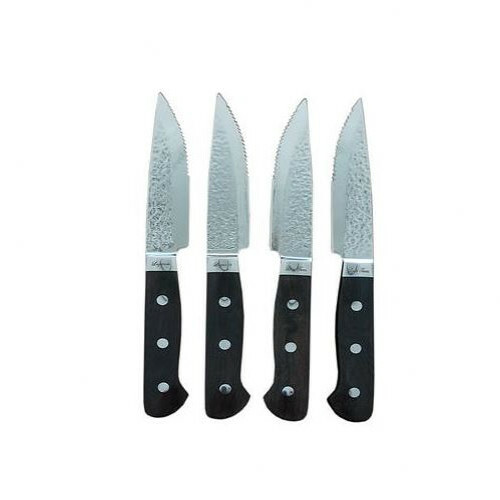 If you have any questions about your purchase or any other Cutlery Sets product for sale our customer service representatives are available to help.Whether you just want to buy a Jumbo Steak Knives Damascus Blades or shop for your entire home, Temple & Webster has a zillion things home.